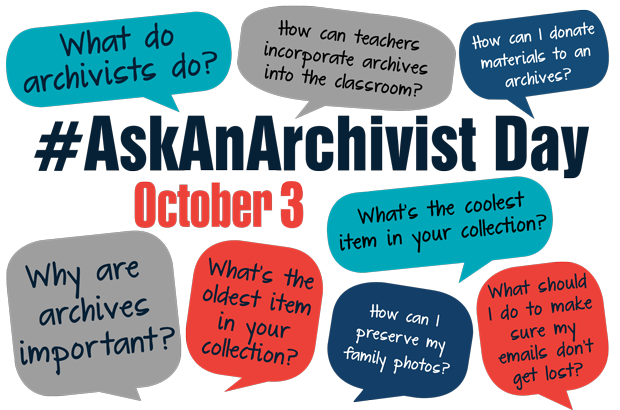 Get ready for #AskAnArchivist Day on Wednesday, October 3, when archivists around the country will answer questions about archives. Find ideas for promoting the day among your users and developing a plan with your colleagues to respond to tweets. Follow other #AskAnArchivist Day participants, and email Abigail Christian with your institution’s handle to join the list. This entry was posted in Uncategorized on September 12, 2018 by Andrew Harris. This course provides an overview of sound archival practices and the long-term care of permanent records. Participants will learn how to determine what records should be archived and how to connect preservation efforts to the processing and storage of collections. Basic physical processing of archival collections — proper ways to identify, prepare, and store materials — as well as evaluating the records for preservation concerns will be covered The importance of maintaining intellectual control of materials, including the creation of finding aids, will be emphasized. Quizzes and homework will allow participants to put their new-found knowledge to use immediately. This course starts on Sep 17, 2018. It is an asynchronous online course designed to be completed in 6 weeks. Participants will spend approximately 2 hours each week on viewing lectures, answering quizzes and completing discussion, reading, and homework assignments. It is recommended that you complete each week’s work within that week to stay in sync with other learners. This entry was posted in News, Uncategorized on September 11, 2018 by Andrew Harris. The Society of Ohio Archivists is pleased to invite you to the SOA Annual Meeting, 50 Years of New Frontiers: SOA at 50, on Friday, May 18, 2018 where we will be celebrating the organization’s 50th anniversary. The meeting will be held at Quest Conference Center in Columbus, Ohio. The plenary speaker this year will be Tanya Zanish-Belcher, current president of the Society of American Archivists and director of Special Collections & University Archivist at Wake Forest University. Ms. Zanish-Belcher will discuss several key components of an archival career, including the role of mentoring and networking, keeping up with trends in archives, and why belonging to professional associations is important. We would also like to invite you to an informal mixer the night prior to the conference, Thursday, May 17, 2018, at the Polaris Grille. The mixer will run from 6:00 p.m. – 8:00 p.m.
For more information about the conference, including hotel and registration information, please visit: http://www.ohioarchivists.org/annual_conference/. This entry was posted in Uncategorized on April 4, 2018 by Andrew Harris. 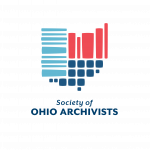 The Society of Ohio Archivists (SOA) is pleased to announce four scholarships available to students (2 awards), and new archival professionals (2 awards) with three years or less experience in the workplace to attend their annual spring meeting on Friday, May 18, 2018 at the Quest Conference Center in Columbus, Ohio. The scholarship consists of conference registration (including lunch), a one year membership to SOA, and a $100 travel stipend. Awardees are required to submit a photograph and write about their experience for publication in the Ohio Archivist newsletter. Applications are due by February 16, 2018. This entry was posted in News, Scholarships, Uncategorized on December 4, 2017 by Andrew Harris. The Ohio History Fund grant application is now available. 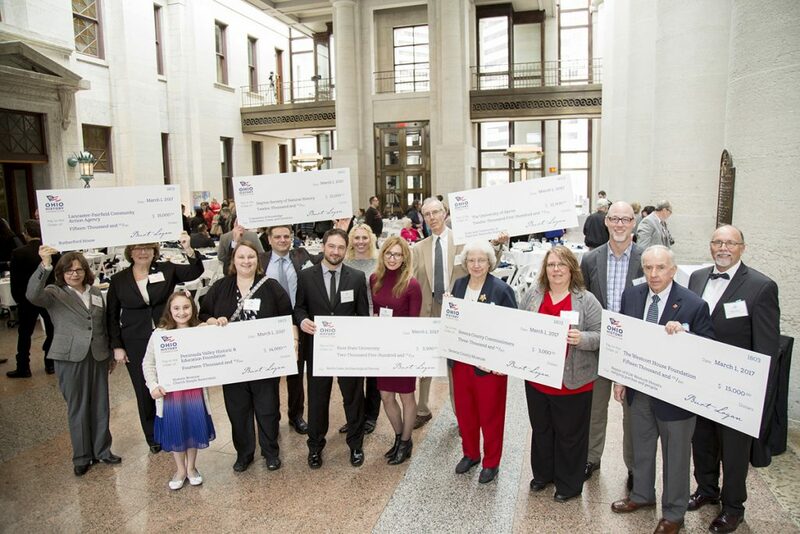 These grants are offered through the Ohio History Connection and support all kinds of history projects including museum collection storage, educational programs, exhibit development, digitization of archival materials and historic photographs, repairs and rehabilitation for National Register-listed historic buildings, archaeological surveys, oral history, and more. Visit ohiohistory.org/historyfund and apply by Sept. 1. The Ohio History Fund is a part of the Initiative for Ohio History, with the goal of sustaining and expanding funding and reaching new audiences with the program. Help us reach those audiences! The History Fund exemplifies the core value of working together. We can also extend the Ohio History Connection’s efforts help others be good stewards of and share authentic history and tell relevant stories. The History Fund is another resource we can use to be ever more inclusive. The Ohio History Fund is sustainable thanks to the tax check-off and sales of Ohio History “mastodon” license plates. And it’s great to see so many “mastodon cars” (my term) in our staff parking lot! Those of you who have any other association with the Ohio History Fund will likely received another email in the near future announcing the availability of the grant application. Sorry for cross-postings. If you have any questions, please contact me – and thanks! This entry was posted in Uncategorized on July 7, 2017 by Andrew Harris. The Society of Ohio Archivists is partnering with the Ohio Local History Alliance for Connecting Communities. This conference will be held on October 7-8, 2016, at the Crown Plaza hotel in Dublin, Ohio. Attendees are welcome to attend any of the Local History Alliance sessions, luncheons, and other special events on both Friday and Saturday. 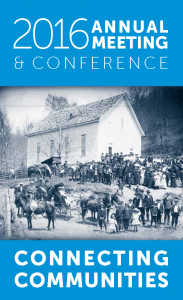 To view the conference program and to register, see conference web page at: http://www.ohiohistorystore.com/events/olha_annual_meeting_2016.aspx or download the registration form: http://www.ohiolha.org/wp-content/uploads/2013/06/2016-OLHA-Brochure-ONLINE.pdf. Interested in attending an upcoming workshop or to learn more about upcoming SOA educational opportunities? Contact the Education Committee Chair. This entry was posted in Uncategorized on September 8, 2016 by Andrew Harris. The Miami Valley Archives Roundtable (MVAR) Archives Crawl is an event held during the month of October to celebrate National Archives Month. Crawlers tour host archives in the Dayton and Cincinnati areas gathering stamps in their passports. Participants will have the opportunity to view a variety of treasures preserved in area archival repositories, visit with archivists, and go on special behind-the scenes tours, depending on the specific repositories that you visit. Please visit the Archives Month Events page for more information about the Archives Crawl as well as other events to be held in the local area. This entry was posted in Uncategorized on September 7, 2016 by Andrew Harris. Registration rates until Friday, May 13, at 5 p.m. $50/ SOA members, $70 / non-members, $35 / students. This entry was posted in SOA Spring Conference, Uncategorized on May 10, 2016 by Andrew Harris. Join fellow history lovers at the Ohio Statehouse to commemorate Ohio’s birthday – and to advocate for Ohio History. In commemoration of Ohio’s founding, we and our partners invite you to join a broad coalition of history advocates for our annual Statehood Day event. The state’s birthday serves as an appropriate time each year for history advocates to come together to help showcase the importance of Ohio’s history and how history, historic preservation and the organizations that help provide access to Ohio’s rich history benefit the Buckeye State. Statehood Day is a celebration of Ohio and its history, as well as a legislative advocacy event! Register today. 1:30 p.m.– later Additional legislative meetings as necessary. This entry was posted in Uncategorized on January 8, 2016 by Andrew Harris. Proposals of traditional panel sessions, student and professional posters, and alternative formats such as lightening rounds, pecha kucha, fish bowl sessions, and other session formats that allow for interaction between presenters and attendees are encouraged. The Program Committee encourages proposals from students, new professionals, first time presenters and attendees, as well as individuals from related professions. DEADLINE FOR PROPOSALS: Proposal submissions are now closed. This entry was posted in Uncategorized on December 9, 2015 by Andrew Harris.